If you’re looking for an easy autumn bake that would be perfect for Bonfire Night look no further than this toffee apple dump cake. Don’t be put off by the name. This style of cake comes from the US and refers to the stir-and-dump-it-in-a-tin method. 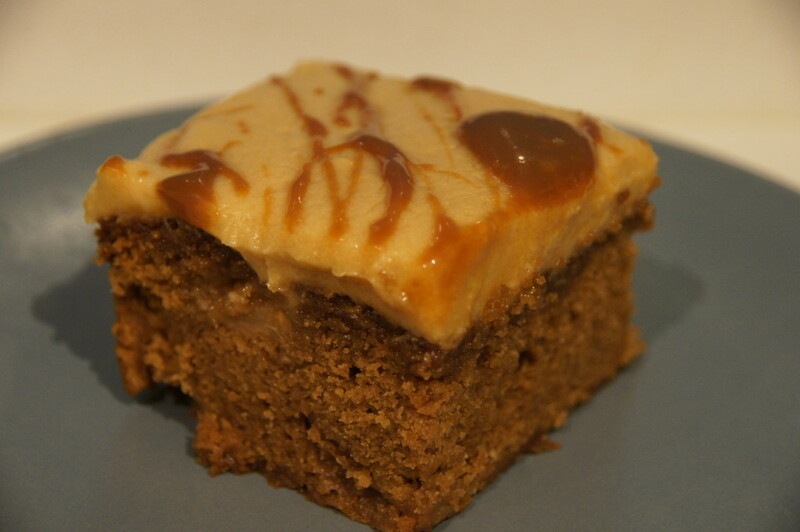 It makes a moist cake with pockets of apple and toffee topped with a toffee frosting. It only needs one bowl for the cake and is actually very easy to make. Mr Birdie took some into work and came home telling me that his colleagues had been raving about it which was lovely to hear (he also said I needed to put it on Twitter which is usually his way of saying he likes something!). This is a recipe from Olive Magazine. You’ll need a 20cm square baking tin. The recipe suggests it will cut into 9 pieces however we found that the pieces were huge so I would recommend cutting it into 16. 1) Heat your oven to 160C/fan 140C/gas 3. 2) Put the butter and muscovado sugar in a food processor (or use an electric hand whisk) and mix for a couple of minutes, then blend in the eggs. Add the flour and baking powder and mix until combined. Stir in the apple and toffee pieces. 3) Pour into a buttered, lined 20cm square tin and bake for 1 hour, or until risen and dark golden. Remove from the tin and cool. 4) To make the frosting beat the butter, vanilla and icing sugar with 3 tablespoons of the toffee sauce until smooth. Spread over the cake then drizzle over more sauce to finish. I work with Mr Birdie and was away when he brought in the cake. There was none left when I returned. Please make some more cake for Mr Birdie.